“The weekend of December 2, 1977 marked the tragic conclusion to a most destructive chapter of Bermuda’s history,” Glenn Fubler said. “As we review this history, it will no doubt bring up some pain. Therefore, we are charged to access our better selves so with courage, we can choose to promote a response that promotes healing in ourselves and our whole community. Minister Burch said, “Good afternoon: I wish to acknowledge members of the various charities and stakeholder groups here today, including the Red Cross, Salvation Army, the Road Safety Council and others. “Let me also acknowledge the representative of the Opposition Leader as well as members of the public gathered here today. “On behalf of the Government, I am pleased to join you in recognizing a significant time in Bermuda’s history – the 40th Anniversary of the 1977 riots. “This was a very tumultuous, dark and unsettled time in our Country, where lives were lost. “Today provides us an opportunity to pause and reflect on our legacy, our history and what steps we have taken to progress our Island forward. “Today also serves to not only reflect on our turbulent past, but it helps to facilitate the discussion of lessons learned or not learned, and what needs to continue to be done to bridge the divides that still exist in our community. “So on a day when we embrace our past, I encourage you to also embrace the possibilities of our present and our future. “And as we prepare to engage in the hustle and bustle of the holiday festivities, let’s use this occasion as an opportunity to come together as a Country in the spirit of today’s theme and recognize that – Every Life is Precious. “I wish to thank the indomitable Mr. Glenn Fubler, who never ceases to find ways to bring our community together – and all those involved in organising this event. Mr Fubler said, “The weekend of December 2, 1977 marked the tragic conclusion to a most destructive chapter of Bermuda’s history. Within those five years, spanning September 1972 up through that traumatic weekend in ’77, ten lives were violently lost. “On this, the 40th Anniversary of that weekend we are encouraging the whole community to reflect on the theme Every Life is Precious, as we look towards a better Bermuda emerging in the 21st Century. “While there was tragedy 4 decades ago, it is evident that efforts from all sectors of our society, successfully transformed that legacy over the interim period. Since that weekend in 1977 there have been no ‘riots’ in those 40 years. “Even three and half years after the explosive tumult of December ’77, in May 1981, Bermuda experienced its largest protest of the 20th Century – with absolutely no violence. In the turmoil of 1977, polarization between the police and people in the streets was palpable; but by 1981 there were high levels of collaboration across those traditional divides – hence that peaceful resolution. “Today each of us is called to realize that Every Life is Precious as we address the cycle of gun violence, the epidemic of deaths on our roads and the growing social divide. As we access our better selves, we will nurture a thriving future to emerge in our Bermuda. On Friday, December 1, 2017 in conjunction with the Road Safety Council, we are inviting drivers and riders to pause for 20 seconds both before and after their journey – driving/riding with their Lights On – mindful that “Every Life is Precious” [Don’t forget to turn Lights Off after]. 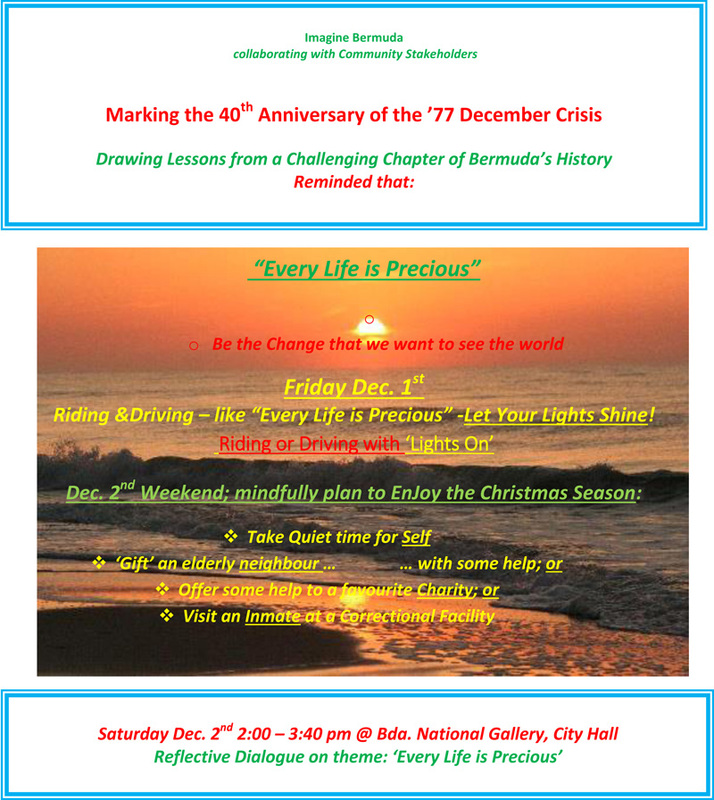 Join a Gathering on December 2nd 2.00 – 3.40 pm at Bermuda National Gallery at City Hall for a Reflective Dialogue on the theme ‘Every Life is Precious’. Anytime over the weekend of December 2nd , please be invited to reflect on how over the festive season that we can give ourselves the ‘gift’ of having quiet time, time out from ‘busy-ness’ for true recreation. Consider offering a ‘gift’ in the spirit of Every Life is Precious to someone outside of our normal circles: E.g. Offer assistance to an elderly neighbour; contact a favourite charity offering assistance – at least over the Christmas period; or visit an inmate at one of the Correctional facilities. Why is it the riots we focus on when it ought to be the actual events of 1972-1973 ? According to credible reports, those guys where scapegoats. WTH are you talking about ? Oh , that’s right . Nonsense as usual . Never mind . Because the irony is the events of 2016 reflect still the attitude of people who were involved that still walk the streets here and abroad. Oh heck no! Why would you want to do that? It is MOST important and imperative to NOT FORGET, to always remember!! The struggles of BLACK PEOPLE will always be a factor in this society ,even though we are the majority. My hope is that we move away from rioting and problem-solve with greater and better strategies so that we are not harmed but let our “oppressors” be totally aware of our outstanding smarts, our people power and our proud knowledge about ourselves! No one in BDA is oppressed. It is definitely a time to reflect upon our greatness as a black race: OUR INTELLIGENCE, OUR POWER ,OUR SMARTS, Our standing together through all of the thick and the thinnest of thins. Power to BERMUDIANS!! So one persons truth is nothing but a lie in your eyes? When he talks about gun violence and lives being precious, is he talking about the assassinated Governor? Maybe he’s talking about the two guys at the shopping center who were tortured for hours and then murdered in cold blood?